This is the page to watch for new workshop content. 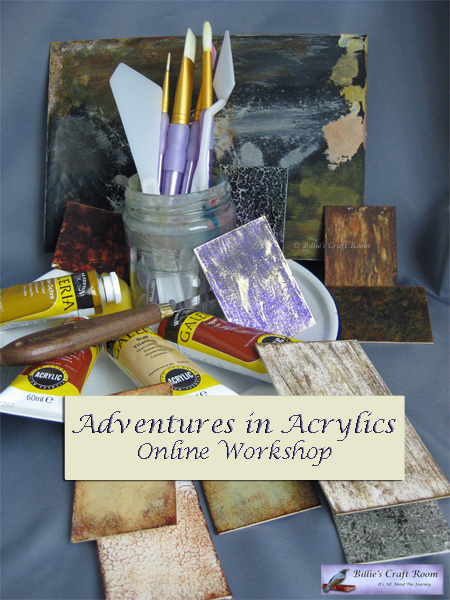 Add the “Adventures in Acrylics” button (as seen on the right) to your blog as a quick way to hop right to this page and stay up to date with all the latest information about the class. If you missed the start of the series, check out this link for all the materials you’ll need. Tool Care First up, how to look after the tools you’ll be using in class. Dark Wooden Book. Preview of a finished piece created using the Dark wooden paint effect painting technique. Discovering your Colour Palette & Making you own Colour Chart. Written tutorial: Get more from your colours. Spice up your colour palette with Interference Colours How to maximise your colour range with just one interference colour. Yey, thats fantastic. Help yourself to the grab buttons for the blog and the workshop, the workshop one will take you straight to the class page. Thanks for the mention on Twitter and your blog too. Expect lots of experiments with paints n mediums, its gonna be a fun and exciting ride. Pass the word on, hope you will play along, its going to be a lot of fun. Looking forward to this-when does it officially start? Tomorrow 🙂 4th May 2012.